Peach Smoothie Recipe, the best of the diet smoothies! 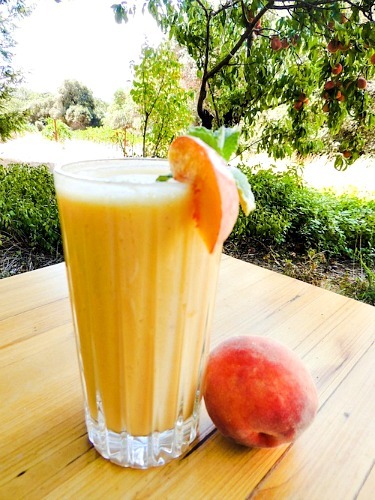 I love this fresh peach smoothie recipe that I make in peach season (late August) when our two peach trees are loaded with peaches. It can be made with frozen peaches too since most of the year the fresh ones aren't available even if you have a peach tree in your yard! Peaches are the most delicate of fruits. Handle them with care - there is nothing like a sun warmed, sweet peach in the summer. They do not last long even in your refrigerator. Peaches make a fantastic smoothie that is low glycemic and low in calories. It's the perfect meal replacement when you're managing your weight. You can't imagine how good it tastes when made with fresh fruit! Even if it's just the orange, which IS easier to find year round, getting it fresh makes a big difference in flavor. Nectarines, which are "first cousins" to peaches, can be used too and are just as yummy. Blend on high until very smooth with a handful of ice. Add 1 - 2 teaspoons coconut sugar only if the peaches are not naturally sweet. Now you have a delicious snack that is low glycemic, low calorie, very nutritious AND filling. This peach smoothie recipe can be a meal replacement when you add whey protein powder or even with just the yogurt. If you're having it for breakfast just add a slice of sprouted grain toast with a little butter, or better yet peanut butter for a complete healthy meal. Peaches are a good source of vitamin A and fiber and they have a little vitamin C and potassium. Nectarines, which can also be used in this recipe, are even more nutritious and usually a little sweeter than peaches. We also have a nectarine tree and they are incredibly sweet when you can get them vine ripened. They have even more beta carotene and potassium than peaches and a moderate amount of vitamin C.
Wash your peaches (or nectarines) thoroughly, cut them away from the pit and add them to the blender skins and all. The skins contribute insoluble fiber which can help to prevent constipation. Beta carotene converts to vitamin A and is a terrific antioxidant. One medium sized nectarine has 800 IU of vitamin A which is 20% of our daily requirement according to the RDA (Recommended Dietary Allowance.) Nectarines are also high in pectin which helps to lower cholesterol. Peaches have less vitamin A but they do have some. It's great if you can find a farmer's market because getting fruits and vegetables that have been ripened ensures that you will get all the nutrients. Not to mention the flavor difference is immense. In fact, peaches are one of the fruits you should always buy organically grown. The Environmental Working Group of the U.S. Department of Agriculture labeled twelve fruits and vegetables that have the most pesticide contaminants and peaches and nectarines are on that list. The others are strawberries, apples, spinach, celery, pears, cherries, potatoes, sweet bell peppers, raspberries and imported grapes. Both peaches and nectarines are a low calorie source of antioxidants. If you are lucky enough to have a peach tree or farmer nearby and can get them vine ripened you can get them a little soft and ripe. Otherwise buy them from a natural foods market, put them in paper bag, store them at room temperature and give them a couple of days to ripen up. Stone fruit especially needs to be eaten after all the sugar comes in and no later! They will have all their nutrients and will be sweet and good. Once they are ripe, refrigerate them where they will last 2 or 3 days. You can make this peach smoothie recipe a meal replacement which is especially protein rich when you add the whey powder. You could even toss in some kale or spinach which will not affect the flavor much if at all and will really give it an added nutrient boost! Return from Peach Smoothie Recipe to Low Glycemic Recipes. Return from Peach Smoothie Recipe to Lifetime Fat Loss home page.